Product #22020 | SKU AH-ME-1 | 0.0 (no ratings yet) Thanks for your rating! The Allen and Heath ME-1 Personal Monitor Mixer is designed to give individual musicians, performers, and presenters the freedom to control their own tailored monitor mixes for use on stage or in houses of worship, rehearsal rooms, studios, conferences, or live events. 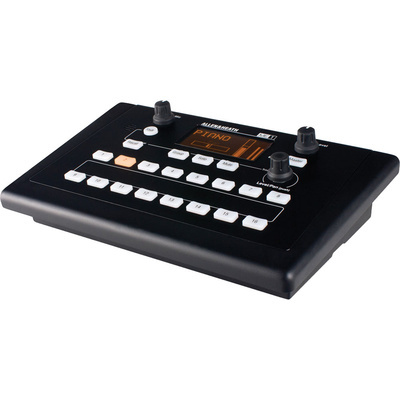 This standalone digital personal mixer receives input from up to 40 sources via a single CAT5 cable (sold separately) from the main console (sold separately) and mixes these to a stereo and mono output to drive headphones, in-ear monitors, loudspeakers, or other monitoring devices over 3.5mm or 1/4" outputs. The mixer features a simple user interface with intuitive, clear visual feedback, and custom naming system. This mixer is the cornerstone of the ME Personal Mixing System (sold separately) and is ready to use with the Allen & Heath iLive and GLD series Digital Mixers. It is complemented by the ME-U Hub (sold separately), which opens up the benefits of ME to users of other professional digital mixers via the Dante AVB-Ready Audio Networking Solution, EtherSound Audio Network Card, or MADI Audio Plug-In Card (all sold separately). It also has an Aviom compatibility mode for use with Aviom Pro16 systems. You can eliminate the need to use up main console buses by grouping the 40 channels within the mixer to simplify control for each musician. You can assign as few or as many of the 16 keys as needed to control the mix. Displays custom names for all channels and groups and automatically names sources from stream when connected to an Allen & Heath GLD system using dSNAKE (both sold separately), it does the work for you by automatically picking up source names from the stream. Utilises etherCON connectors for daisy chaining or star topology using the ME-U Hub (sold separately) or off-the-shelf Ethernet switches for any number of ME-1 Mixers.